I don’t know about you, but I have a mixed bag of emotions when I think about puzzles. My Grandpa was a stickler about them. You had to look at the piece and just know whether it fit or not. There was no “trying to see if it fit”. He was like the Yoda of puzzles. But I also have some beautiful memories of puzzles. I’ve searched for years for a duplicate of a puzzle we put together as a family at Christmastime each year. It had pieces shaped like snowmen and ice skaters with hidden shapes. It was awesome. No luck on finding it though. Woe to me. I wanted to share a set of puzzles that’s even more amazing (at least to a geography nerd like me) than my favorite hidden shape puzzle from childhood. I discovered these recently and they are just fantastic. Geo Puzzles . which includes The World, Europe, Asia, Africa, USA/Canada, and Latin America (South America and Central America). The pieces are shaped like countries, lakes, states etc. and fit together as a map would. You can see here the size of the pieces. The United States pieces are smaller than these because they’re scaled with Canada and Alaska. Which, really is huge by-the-way. The completed puzzles are around 19×16 inches. They came in individual bags and had empty ziploc style bags to put them in after opening the shipping bags. Sweet! My daughter immediately began assembling the Europe puzzle, which was the main focus of our geography for Cycle 2 of Classical Conversations this year. It was amazing how many countries she was able to accurately place without the help of the printed map that comes with the puzzles. You can see below everything my set came with — the printed maps are two-sided, the packing bag is on the far right and the bags that come with to store them in are on the far left. 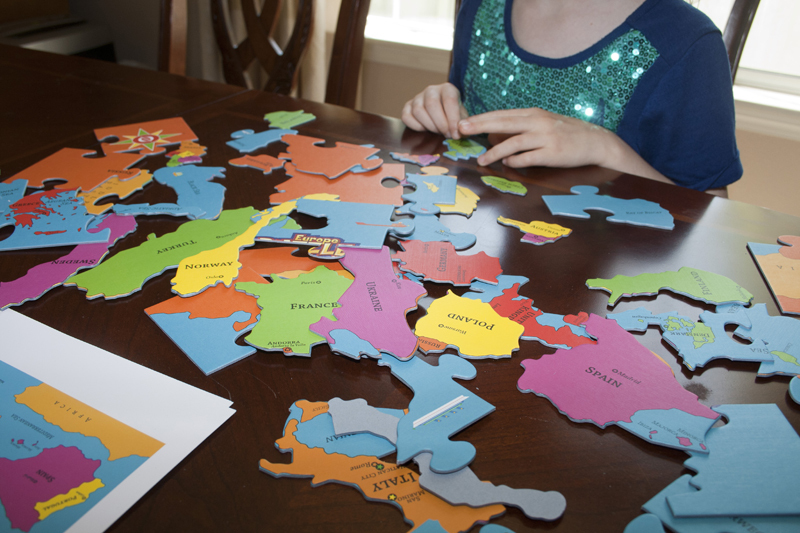 My kids moved right on to the United States and Canada once they’d completed the Europe puzzle. And then asked if we could do a couple more tomorrow. Success! 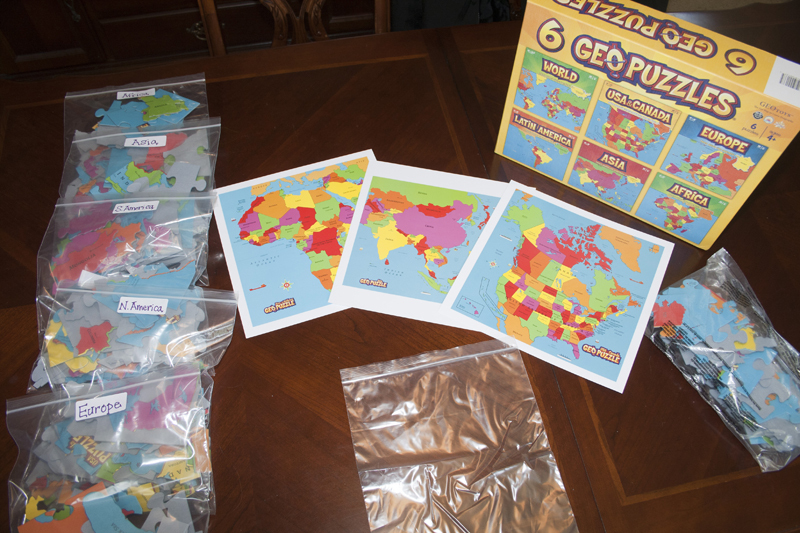 If you are a puzzle family, studying geography, or would just like to learn while you play, I highly recommend these! You can purchase them individually too. I just know that our Classical Conversations curriculum is going to cover the whole world, so I figured it made sense to just get them all in one box. The individual puzzles are about $16 each. Next > Limited Time Only! Free Geography Curriculum!